The Armor Modeling and Preservation Society, Inc., or AMPS, was founded in July 1993. Since that time, AMPS has grown within the U.S. and worldwide. 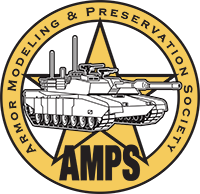 AMPS functions as a modeling club whose purpose is to foster knowledge and appreciation of the history of armored vehicles, through examination of preserved examples located in both museums and private collections and in miniature through modeling. AMPS publishes for its members a bi-monthly journal called Boresight that covers reviews, tips, articles on preserved vehicles, and comparisons of models and related items. AMPS has a Constitution and Bylaws to govern how it is run and the AMPS judging system rewards modelers for individual effort using a point system to minimize subjectivity. AMPS hosts an annual international convention in which the subject of armor is supreme. The convention features armor model vendors, seminars from armor experts and an array of the best armor models from around the world in its competition. Competition is organized into five levels--junior, basic, intermediate, advanced, and master--and the judging system rewards the modeler for his individual effort, not in comparison to other modelers.